Last summer, many of us enjoyed Matt Gaffney’s meta-crossword murder mystery. This summer, Victor Barocas has launched a Kickstarter to secure backing for Ada Cross, Crossword Detective—eight short mysteries each with five crosswords to help you crack the case. Across and Down crossword cartoonist Hayley Gold will illustrate Victor’s project. Are you in? I am! The theme revealer is IT’S IN THE BAG, 56a. [“We have this won” … or what could be said about each of the first words of the answers to the starred clues]. 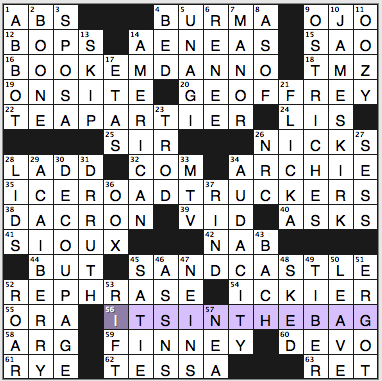 Those first words can all precede “bag,” and in particular, each of those things is contained inside that kind of bag. I.e., you may find a book in a book bag, and tea bags, ice bags, and sand bags are defined as bags of those stuff. The book bag is a bit loose, as the typical person carrying a book bag has a lot of other crap in there too. 16a. [*”Hawaii Five-O” catchphrase], BOOK ‘EM, DANNO. 22a. [*Sarah Palin or Glenn Beck, e.g. ], TEA PARTIER. 35a. [*History channel show frequently set in Canada or Alaska], ICE ROAD TRUCKERS. 45a. [*Structure built from the ground up? ], SAND CASTLE. 9a. [Eye of the tigre? ], OJO. Hey! I know you want to watch a classic ’80s video, Survivor’s “Eye of the Tiger,” or! Or! You could enjoy the same song in a two-hour loop in this bit of YouTube lunacy. 37d. [Thick skin], RIND. Anyone else start with HIDE here? That made 42a. [Apt rhyme of “grab”] look like the mystifyingly inapt DAB rather than NAB. 10d. [TV/movie lead character whose middle name is Tiberius], JAMES KIRK. What? No. He’s James T. Kirk, or else just Kirk or Captain Kirk. “James Kirk” is all wrong. A fair amount of the fill didn’t feel like Tuesday-grade material—Spanish OJO, Italian ORA and SPOSA, German faux plural NEINS, TESSA, SATIE, SKED, TIBER, and ERGOT? 63A [“If these clues get you nowhere, you can ___ to stimulate the mind!”] CHEW TIN FOIL – The pain may be annoying! 15A [Actress Remini] LEAH – My postmistress sister’s name! 45A [College sr.’s exam] GREB – Did you have SAT in there, too? 58A [What Frank mistook his intervention for in “It’s Always Sunny”] ROAST – Season 5 Episode 4 of It’s Always Sunny in Philadelphia. Warning: This show is crazy! 61A [“___-la-la!” (Captain Underpants call)] TRA – Haven’t read these books either. My kids have. Seems to silly for me. Livelier clue than “musical refrain syllable” or something of that sort. 72A [Restaurant reviewer’s website] YELP – I have never reviewed anything on here. Maybe I should start! 31D [College student’s stereotypical meal] RAMEN – I always tell kids these don’t taste the same when you HAVE to eat them…! 39D [___ Aduba (“OITNB” actress)] UZO – I think this may only be the second time I have seen her name in a puzzle. She will be crossword famous in no time, or at least as famous as the UZI weapon! Another great puzzle. Can’t wait for next week’s Jonesin’! Nicely done. I wasn’t paying attention to the circles until the end, so then I was going back and seeing what was spelled. Made for a nice solving experience. 3.5 stars. I usually say, “What a spread!” when I am a dinner guest; it’s implied that there is a nice spread at the buffet restaurant! 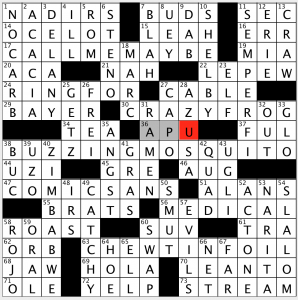 26A [“Yay!”] YIPPEE – Nice. Word is probably more common than I think! 3D [Both players in unison, musically] ADUE – Kinda crosswordese-ish, but not to hard. This and 5D the only slightly annoying fill. 5D [Lounge about, in British dialect] LOLLOP – Do not know this word. Really don’t know British slang. We’ll chalk it up to a word learned! DOLLOP I know, but it looks that would be hard to work in. 26D [Santa ___ Valley: wine region in which “Sideways” was set] YNEZ – Probably a little obscure; the clue makes it relevant. 29D [Chinese menu general] TSO – I recommend The Search for General Tso, a documentary on Netflix. I just had this on Sunday! 35D [Bra size] B-CUP – Could be A-, B-, C-, D-, and so on. Nice to have to wait for the crossing entry to fill in the answer. This puzzle was fun. Isn’t that the point? I just got a library card for the first time in many years, and one of the first books I checked out was From Square One by Dean Olsher. I had never heard of this book, but he so far is doing a good job of explaining why I do what I do all the time. If you haven’t read it, I recommend. Hope to finish it this week sometime. 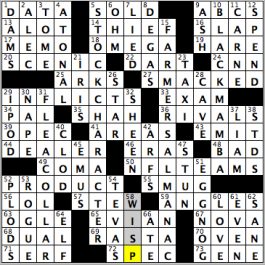 He does speak about crosswords providing a pleasure point, and this puzzle fit that bill nicely. Well, here’s a curious conundrum for me. Today we have a gimmick that involves a set (or “pattern”) of embedded letters. Said pattern relates to a specific type of “speech”—namely, as is revealed at 63D., ASL [Communication syst. that’s hidden in five answers]. And what an expressive communication syst. it is, used by millions in the U.S. Now I tend to enjoy this kind of gimmick. And while I flat-out loved the themers, I was left a little cold by this particular letter set (although I think I know the “why” of its existence…). Is that that I prefer embedded words instead of letter groups? I’m thinkin’ that may in fact have something to do with it. May have appreciated the cruciverbal celebration of ASL more, too, if this were a commemorative puzzle, but from what I can tell, exactly when in the later-first-quarter of the 19th century it came into existence is a bit fuzzy. So much for the diss-ertataion portion of the post. On to those five fabulous themers (occupying exactly one-third of the grid’s white space [sweet!]). All are clued in a straightforward way. 17A. GAS LANTERN [Quaint streetlight]. And quaint fill. I was trying to stretch out GAS LAAAAMP. But it wasn’t gonna fly. More hearkening back to another era, too, with TRAMLINES, those [Tracks for streetcars]. 50A. A SLAP IN THE FACE [An insult]. 61A. 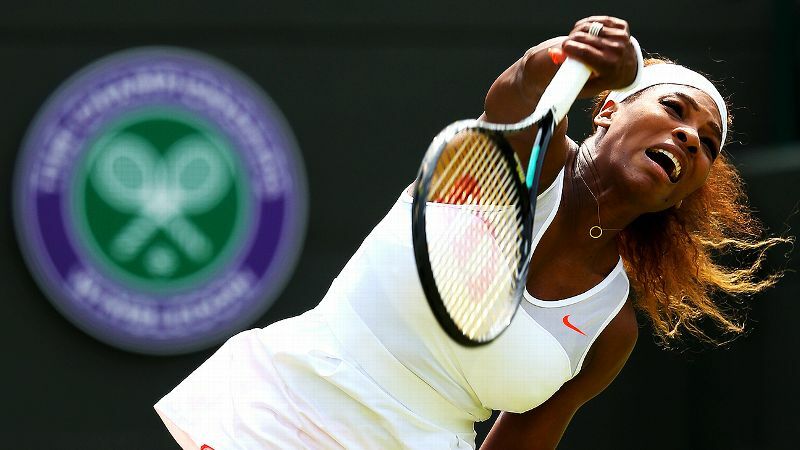 SERENA SLAM [Tennis great Williams has twice completed this four-in-a-row sweep of major titles]. Aha. Here’s where I think we get to the seed entry (the top seed entry, if you will) of today’s puzzle. Until solving the puzzle, I confess to not having caught wind of the phrase. It doesn’t live on Google Ngram so can it be real? It sounds like it could be real—or is this some kind of “roll your own”? For starters, Google Ngram draws its stats from books and no other print media. Okay. So the phrase hasn’t shown up there. Yet. On Google, however, it’s a whole other ball game (if you will again). On the heels of Ms. Williams’s recent Wimbledon win and achieving this benchmark for a second time, this term for taking four consecutive titles is as fresh and sparkling as can be. Like Serena herself. The woman is amazing and seems to be unstoppable. Come September, I keep hoping for….. Well. Don’t wanna jinx nuthin’, so I’m gonna assume you catch my drift. The prefix/suffix brainteasers in the [Inspiring leader?] AWE and [Dial back?] TONE combos. [He flatters the boss with fake affection] for the fab KISS UP. Just one strong pair there. Fave [Factual tidbit] DATUM: [Pres. Cleveland’s bills] THOUS. Did not know that. Did learn that Alexander Hamilton once lived there, and that he, like many others who find themselves engraved on our bills, is not the only one who’s played (and will continue to play) monetary musical chairs. Does the puzzle have soft spots? Well, yeah. But the less time discussing the likes of the functional (but little fun) OOO, III, OMER, ESE and -OLA the better. Good morning, people! 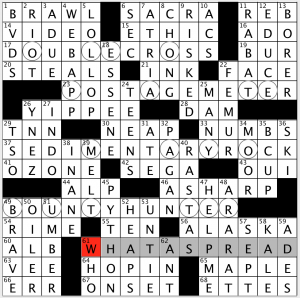 It’s Mr. Ian Livengood’s turn to provide today’s crossword, and in it, each of the theme answers goes down in the grid, and each start with a word that can also precede the word “market.” Here’s hoping this isn’t a sign that the market is going down today on Wall Street. BLACK MAMBA (10D: [Venomous African snake]) – Also, the nickname of Los Angeles Lakers’ great Kobe Bryant. I’m not kidding. Are there any classical musicians out there who want some more ATONAL music out there for consumption (4D: [Like some 20th century music])? Not sure if I can think of some modern atonal music off the top of my head, but, then again, I’m far from the music expert. Might get a little flak for it, but I had never heard of TEVAS (Teva sandals) before (54D: [Sporty sandals]). Though, now that I’m looking them up, I definitely have seen many people wearing them. Don’t know why I had not heard of the brand name. If I’m correct, our constructor recently had an NYT puzzle that had a “five-star” theme, and one of his entries in the puzzle was “Chinese flag.” We have something a little similar going on today, as STAR makes the grid and has a reference to the Far East (26D: [One of five on the Chinese flag]). Pretty smooth solve, and almost junk fill-free. “Sports will make you smarter” moment of the day: NFL TEAMS (50A: [Jaguars and Panthers]) – Both NFL TEAMS mentioned in the clue, the Jacksonville Jaguars and Carolina Panthers, entered the league at the same time and debuted in the NFL in 1995. Amazingly enough, one year later, the Jaguars and Panthers were both just one win away from setting up a Super Bowl matchup of expansion teams. In the 1996 AFC playoffs, Jacksonville defeated Buffalo and shocked top-seeded Denver to make the AFC Championship Game, but then lost to the New England Patriots. After a stellar 12-4 season in 1996, the Panthers earned a first-round bye, then defeated the Dallas Cowboys in the NFC Divisional Playoff Game. In the NFC title game, however, the Panthers lost to the Green Bay Packers. If two expansion teams had met in the Super Bowl just a year after coming into existence, it probably would have ranked as one of the five most surprising sports feats in the history of team sports, at least in my opinion. This entry was posted in Daily Puzzles and tagged Daniel Nierenberg, David Phillips, Elizabeth C. Gorski, Ian Livengood, Matt Jones. Bookmark the permalink. 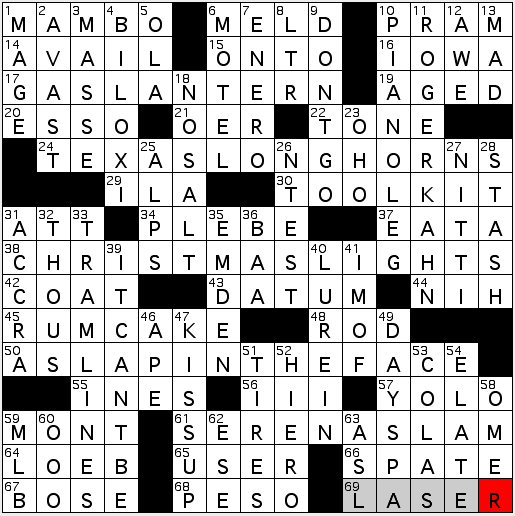 NYT: [… Tiberius] (10d) in the same puzzle as 49d TIBER?! Which raises the question — was Capt Kirk named after the river, or was the river named after Capt Kirk, in a time-traveling episode where the Star Trek crew saved Romulus and Remus by placing them with a helpful wolf family? Tiberius was a Roman emperor, successor of Caesar Augustus. According to Wikipedia, they share an ancient, local root: It is probable that the genesis of the name Tiber was pre-Latin, like the Roman name of Tibur (modern Tivoli), and may be specifically Italic in origin. The same root is found in the Latin praenomen Tiberius. None of this has anything to do with whether the words together comprise a flaw in the puzzle or not. I never noticed it, perhaps because the entries were separated by so many millennia, but I realize sensitivities vary. LAT: The “spreads” aren’t exactly spread out. The butter, for one, is a bit clumpy.